Add a breath of freshness to your bathroom with the Tetragon Wall/Pedestal Basin. This practical and incredibly attractive bathroom basin features a modern design, and can be used as a wall basin or a pedestal basin. The Tetragon Wall/Pedestal Basin measure 470x550mm in dimensions. It is designed to offer easy installation and is suitable for medium and small sized bathrooms. This bathroom basin is all about smart looks and great functionality. It boasts of an impressive bowl capacity of 6.3L, which is much larger than other basins of similar size. Additionally, it includes a single tap hole and comes equipped with a standard overflow. 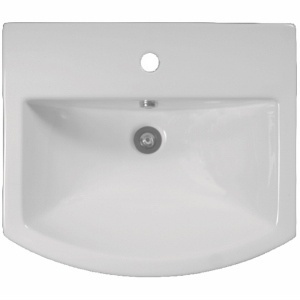 The Tetragon Wall/Pedestal Basin is a superior grade product that is manufactured using top quality vitreous china. It is highly durable and incredibly sturdy and will therefore, offer you several years of service. The Tetragon Wall/Pedestal Basin can be accessorised with a pedestal or a shroud. However, these accessories need to be purchased separately. So go ahead. Transform your dull bathroom into a fresh modern space with the Tetragon Wall/Pedestal Basin. Buy this gorgeous bathroom basin in Perth at a very reasonable price from our online store today!